God is with us but where? Another year, another Advent season. God is with us and it is spectacular. Or, maybe it isn’t anymore. Perhaps, we are beginning to feel that God has come and gone due to a political season that has taken a toll on the American psyche. And then there is the fact that Jesus’ story could now be confused with another Disney film. No, Mary is not waiting in a castle for a prince to save her. She already has a fiancé, which makes things a bit complicated at first. “First comes love, then comes marriage, then comes the baby in the baby carriage. Despite the addressed wedding invitations and a near complete reception dinner seating chart, God sends a message to a teenage girl. She is the least likely; they will not check her womb for the Messiah. Our memory of Christ’s birth gets a little sketchy after this. We don’t remember it like his mother would. Our neat nativity scenes show no signs of labor. Like the cross, we have removed all references to her suffering. No pushing and pulling, only holy awe and adoration. No screams of pain, only the praises of the angels. I suppose we are also expected to believe that she cleaned up after giving birth to the Son of God. Despite our unrealistic depictions, God is with us — not by satellite or even as a hologram. Mysteriously, the Spirit God puts on flesh. If that is not confounding enough, God comes not as a king or even a grownup but as a baby, cooing and kicking. 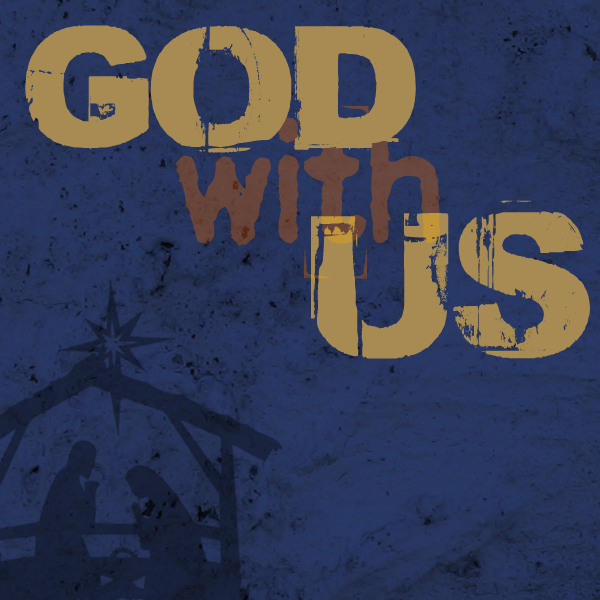 During this Advent season, we declare, “God is with us.” But, where? Where have we followed Jesus to? Or, is Jesus following us around? American capitalism would have us to believe that Jesus is in stores — not sanctuaries. The announcement of his birth replaced with powdered sugar jingles. Our good news comes in coupons. The Savior of the world has arrived and we are following the sales. What a discount. God is with us and we are out shopping. It is so easy to dismiss him now. It is all in fun and for the sake of tradition. More trees, more tinsel, more presents. Pass the egg nog and hold the mistletoe. God’s world becomes an ornament — a shiny, hollow, glittery shell. God is with us. But, the star of Bethlehem now competes with Christmas lights? Thanks to Siri, we would consider ourselves wise but would we travel to visit him despite the rise in gas costs, traffic forecasts and weather predictions? And what gifts would we bring, for he has no need of a 64- inch flat screen television? Or, are we looking for someone else, the made-up Jesus that Wright talks about? Who is this Jesus who fits into our cultural folklore of a snowman who comes alive and a red-nosed reindeer who discovers his purpose? Who is this Jesus who doesn’t mind us waiting up for Santa because he was born under a Christmas tree? Oh, the irony that his story is now second to the ones that we have created. There was no room for him in the inn, but is there room for him now? Where would Jesus fit now? Whose home would be ready to receive him? What space have we created for a woman in labor and preparing to deliver the Son of God? We gather around to sing carols and she is panting and sweating. We are decorating Christmas trees and Joseph is holding her hand and dabbing her brow. We are baking cookies and the animals are kicking up dirt and joining in this holy racket. We are making crafts and they are making a blanket out of a milk rag. I hate to break it to you, but Jesus does not enter the world with a bow on his head. God is with us in Christ Jesus, and the story should not be left up to the magic of Disney because it is his story — not ours. Phyllis Tickle writes in the foreword to Jesus Brand Spirituality, “The faith we Christians claim has been so dented and chipped and discolored by the centuries, so institutionalized and codified and doctrinalized, so written upon and then so overwritten into palimpsest, that there are few Christians who still can discern the contours of the original.” God is with us. Really? Where did you see his star? From where did you hear his cries? Or, is it a distant memory, the echo of centuries ago? Are we merely repeating what we have heard, taking pictures of a memory that we don’t have time to participate in? Yes, God is with us but where? *This post was originally written on December 22, 2016 and shared with the community of readers at Baptist News Global. I love prayer. Despite the popularity of social media, status updates and tweets do not compare to sharing a prayer request with God. There is no better connection. The fact that we can be in direct dialogue with the Divine, a kind of call and response between heaven and earth, amazes me. I delight in the sounds and scenes of prayer, the moans and sighs, the bowing of heads and bending of knees, the folding of hands and quieting of minds. I am grateful for the reverence expressed and the reminder that God is listening out for us. I appreciate the variety of prayers — contemplative and silent, communal and chatty, spontaneous and written. I love prayer groups and prayer chains. I even write a prayer newsletter for our member churches at the District of Columbia Baptist Convention and a column, Pray-Her, for Smyth & Helwys’s blog. Cheryl Sacks wrote a book, The Prayer-Saturated Church, but I think I am well on my way to becoming a prayer-saturated person. I spent my formative years in weekly prayer meetings, seated next to my grandmother, Sister Thomas. Attending church was my extracurricular activity and I felt naturally gifted to serve. When I was not in church, I would practice with my cousins. We called it “playing church,” as we would pretend that we were the preacher, a deacon, an usher or one of the mothers of the church. You can guess which one I was. A mid-week service for blue-collar workers on a nameless country dirt road, it was essential to the community’s emotional, personal, physical, social and spiritual well-being. The church services kept us going and kept our heads up. While it did not have the resources of today’s megachurches with barber shops and beauty salons, gyms and exercise classes, banking centers and conference-style meetings rooms, it still met our needs. Besides, our church membership extended beyond the building as we went shopping and out to dinner together often. Now an adult and an associate pastor, I lead our time of prayer. While I write down my prayer, the order is left up to the Holy Spirit. And I still first give honor to God who is the head of my life. “Satan goes to a prayer meeting” is the title of a sermon by the late Reverend C.L. Franklin. It appears on a sermon collection released in 1994. I was reminded of the title on June 17, 2015, when I learned of the murder of nine church members, including the pastor and state senator Clementa Pinckney, at Emanuel African Methodist Episcopal Church. The horrific acts put Charleston, S.C., on the map as authorities tried to locate the suspected killer, Dylann Roof. In light of this sad reality, I was stunned to hear of this “campaign to eliminate hell.” I didn’t know that it was a goal or an expressed need of America’s Christians: better education, better economy, more jobs and no hell. I suspect that it is the privileged view of those seated in academia’s ivory tower with its socially-engineered greener grass. But it’s foolishness to those whose communities are burning and an unstable perspective. Light and darkness, mountain and valley, salvation and sin, these combinations are the human condition — at least for some of us. Furthermore, our desire to rework God’s plan so that everyone fits into heaven, to relocate those who have done evil because it makes us feel better about God and ourselves is misplaced. It sounds a bit like Oprah: “You go to heaven and you to heaven.” While we are “the hands and feet of Christ,” our hands don’t balance God’s scales. Besides, if everyone is a “good person,” then the nails in Christ’s hands are meaningless. That’s not tradition but the gospel and our story, summed up in a popular Sunday school memory verse: “For God so loved the world that he gave his only begotten Son, so that everyone who believes in him may not perish but have eternal life” (John 3.16). God’s love requires justice — because sin matters. If not, then what is the hope of the world’s victims, the vulnerable and those deemed valueless? Are they mere scrap people, piled into an overcrowded prison system, crammed into tight, poverty-stricken areas or sold for pleasure in our lust-driven world? What is the good news for those nine praying members? Evil is real and the Devil does not come in a red jump suit. Though I am not suggesting that Roof or any other person who commits heinous acts is Satan or even beyond the saving grace of God, I am certain that good and bad do not pray well together, that bowed heads should not have bullets in them and that evil is present with all of us (Romans 7.21). For those who have rightly judged the Church due to hypocrisy, sexual misconduct, spiritual abuse and financial mismanagement, what do we do when the Church is the victim? When we welcome the stranger in love and he turns out to be a hate-spewing enemy? When a church becomes a crime scene and yellow tape covers the stained glass, it’s probably not the best time to talk about the end of hell. But when Satan comes to a prayer meeting, it certainly changes the order of things. I couldn’t find meaning in their murders then and I cannot come to terms with it now. I suspect that it will take many more prayer meetings. *This post was featured as an Op- Ed for Baptist News Global and was published on June 9, 2016. In order to keep in touch with parishioners, many pastors make phone calls, send greeting cards, emails, text and direct messages. This is the result of multi-generational ministry and the influence of social media. In an effort to reach our members, we must go where they are and be able to speak their language. And they expect us to know where to find them and how to get in touch with them. It proves our relational proximity and ability to connect. It’s not easy. Unlike Jesus, we cannot stand on top of a mountain and expect a hearing, at least not without Sunday morning announcements, email blasts and mailers. Warning: We should not allow our social media accounts to deceive us; maintaining a following is harder these days. Despite the various means of communication, it is becoming more difficult to reach people. With so many persons to answer on Facebook, Twitter, Instagram, Snapchat, Periscope and personal blogs, sitting in the “Amen corner” on Sunday morning might prove to be too much. Maybe it is becoming easier to hit the like button instead. And to think this does not include all of the shows that we DVR and then, binge-watch because there is just so much that we need to know and be apart of. Like pastors, parishioners may feel the pressure to participate in conversations across a broad spectrum. When I asked my Millennials about this reality in Sunday school, they described it as a “word overload.” There are words coming from everywhere and all the time. There is no break from sound, no break in conversations. Maybe this is why they are quiet on Sunday mornings; their tongues are not tied but tired. Or they have reached their word quota and by the time they sit down for the worship service, they are maxed out. Even though we are talking about God, they really don’t want to hear another word. It’s no wonder that getting members to attend midweek Bible study is a miracle and not because we offer food. They are no longer impressed by our provision of fish and loaves. Persons no longer come for a free meal and they can fellowship online. Maybe this is why some churches are giving would-be visitors the television show treatment on high holy days, offering giveaways that include flat screens televisions and a car. No, each member will not get a car — they aren’t Oprah. It seems that pastors are pulling out all the stops. They are trying all kinds of methods in order to spread the message of Christ. Still, reaching this generation or any other (as our grandparents are now online) even when they are in the pews is difficult. It is problematic because social media has redefined what it means to be present and involved. It is defined by Internet connection and the faster the speed the better, which translates to shorter service times and fewer words. Now, we are real because we have a visible online presence. We are worth seeing if we have an online profile. If we do not have a social media account, then we do not exist. In some ways, our church and any other is authenticated online. To be sure, this is where many would- be visitors get their first look at us. The ushers are no longer the first face they see. The Internet and social media have also changed the way we practice our faith. Bedside Baptist Church is a reality because we can now live stream the church service from our home. We can literally praise God in our pajamas. We can be in worship and at the grocery store or the gym. We can attend church and go to the coffee shop at the same time. In many church bulletins, we ask parishioners to turn off their phones. But, most just silence the ringer. They are in a serious social relationship and must be faithful to their phones. They cannot put them down or look away for long periods of time. And they don’t need to because the Bible is on their phone. It’s an app now. So, what’s the problem? The problem is our attention. It cannot be held for long and it is best if we focus on one thing at a time, which is why it is illegal to text and drive. You cannot keep your eyes on the road and your phone at the same time. Likewise, we cannot keep our eyes on Jesus and our phones at the same time. We cannot hold our phones and carry our cross. It is not a balancing act to be attempted. We cannot follow in his footsteps if we are not looking down at them. With all of the words that we see and say, it would be a shame to discount the Word made flesh. You may be thinking: It’s just a phone. I can put it down any time I want. OK. Deal. Put the phone down slowly and walk away from it. Sit down in a quiet space and “have a little talk with Jesus.” Try telling him all about your trials and triumphs — before posting it on social media. Offer your prayer requests to God without making a hash tag out of it. Like these conversations, discipleship is not to be interrupted. With all of ways of keeping in touch, prayer remains the sure way to connect to God. It is its own language that speaks to everyone, requiring no Internet connection or the latest phone. And if God can be fully present when in conversation with us, then why are we so distracted? * This article appeared first as apart of my monthly column with Baptist News Global and was published on Thursday, April 14, 2016. I need to see your hands. Put the pen down and slowly back away from the list. Before you begin your annual declaration of independence from unhealthy food and toxic people, before you purchase the gym membership or enlist your friends as accountability partners, before you buy clothing two sizes too small or a new car based on credit unseen because of the new vision you have of yourself in the New Year, we need to talk. We need to discuss the noteworthy realities of your life — not the top 10 movies, songs or news stories of the year. It is easy to define our lives using the expressions and experiences of others. However, I would challenge both of us to live on our own terms — not as screaming fans of the airbrushed and photoshopped lives of others but as active participants in our own. So the events of your life weren’t among the popular hash tags or trending topics on Twitter. Your daily post of selfies on Instagram missed your like button quota by a long shot. Your God-given or family member-appreciated talent didn’t make you an instant YouTube sensation. It wasn’t viewed by millions of people and there may not be more than a handful who can relate to your experiences. What is the meaning of all of this for you and me anyway? Put the phone down too unless, of course, you are reading this article. In this case, it is being put to good use. But don’t take another picture or record another video in the never-ending task of improving upon our image minute by minute and day after day. Instead, you need to see yourself for you and not for the followers that you hope to gain. So before we begin the countdown to the New Year, I think that we need to slow down. James Finley believed, “When we meditate, we slow down so that we can begin to catch up with ourselves.” This, then, is an invitation to think about ourselves. Let’s think about who and why we are right now, which is not to be confused with or swapped out for the self we hope to be next year. And don’t rush yourself. More than catching our breath after wrapping gifts and opening them, preparing meals and sharing in them, packing luggage and welcoming extended family, we could benefit from finding the person we have allowed to fall behind. We might want to slow down, go back and get ourselves. Because it is possible in our haste to begin the New Year and the celebrated quest for the new me to lose sight of who we are. Whatever the reason, we would rather count down to midnight than look at time present. That’s a ghost that we don’t want to visit us. Besides, why do we need to? The unopened and unused days of the New Year, the sweet 16 of the millennium, is much more appealing than examining what was. No, the thrill of the chase of Jan. 1 is the possibility of what could be and who we can be. We could meet the right person. We could land the perfect job. We could finally lose those pounds that seem to hang on to us like a tantrum-throwing toddler. The time calls for us to leave what didn’t work, what went wrong and who didn’t last. There is an unmarked dumpsite or a return center for all of these things somewhere. What was once labeled possibility, opportunity or even blessing is now marked baggage, garbage or loss. This is why new sounds so much better. New shoes. New day. New Year. If there is new in front of it, then we’ll take it. No, it probably won’t happen in minutes or seconds. It won’t come with fireworks or cheers or happen in a large crowd. It probably won’t be a part of the coveted list of things that we have to do. Instead, it will come with time, with New Year after New Year. God’s hands are not an hour and minute hand. Change, meaningful change, is done in God’s timing. Whatever we think of our external reality and presence in the world, there is a treasure within — at least that is what the Apostle Paul tells the believers at Corinth (1 Cor. 4.7). So, do a careful review of your life and be mindful of what you throw away. It might be a candidate for newness. Murderer of Christians turned martyr for Christ, Paul’s words ring truest in my ears. He reminds me that all of my time is new — not because of what I leave behind in this year or any other but because of what Christ left behind and lost so many years ago. He says, “For the love of Christ urges us on, because we are convinced that one has died for all; therefore all have died. And he died for all, so that those who live might live no longer for themselves, but for him who died and was raised for them. From now on, therefore, we regard no one from a human point of view; even though we once knew Christ from a human point of view, we know him no longer in that way. So if anyone is in Christ, there is a new creation: everything old has passed away; see, everything has become new!” (2 Cor. 5.14-17, NRSV). Our new is always now and our resolution is Christ’s. New does not begin with our clock but his cross. We need only see his hands. Happy New Life! * This post is a part of my monthly column for Baptist News Global and was published on January 1, 2016.